Application Server job failed for service instance Microsoft.Office.Server.Search.Administration.SearchDataAccessServiceInstance (66b23c64-ec7b-4e9c-93f5-a63d4d173214). Reason: An update conflict has occurred, and you must re-try this action. The object SearchDataAccessServiceInstance was updated by domainname\admin_account, in the OWSTIMER (572) process, on machine OST-SPWEBDEV. View the tracing log for more information about the conflict. 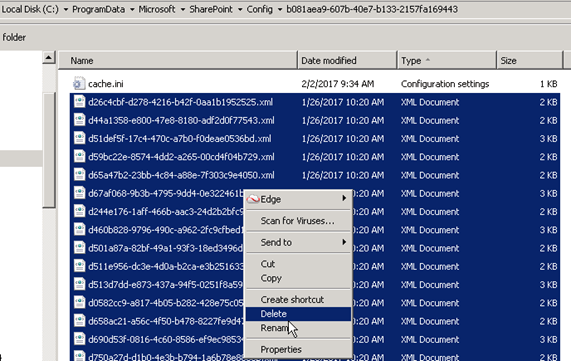 Microsoft.SharePoint.Administration.SPUpdatedConcurrencyException: An update conflict has occurred, and you must re-try this action. The object SearchDataAccessServiceInstance was updated by DCWASA\spfarmd, in the OWSTIMER (572) process, on machine OST-SPWEBDEV. View the tracing log for more information about the conflict. Delete all the XML configuration files in the GUID folder. Do this so that you can verify that the GUID folder is replaced by new XML configuration files when the cache is rebuilt. Note When you empty the configuration cache in the GUID folder, make sure that you do not delete the GUID folder and the Cache.ini file that is located in the GUID folder. On the Edit menu, click Select All. On the Edit menu, click Delete. Type 1, and then click Save on the File menu. On the File menu, click Exit.